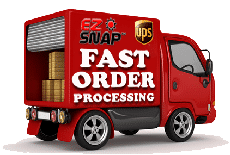 EZ Snap® exterior shades have the following benefits for residential window shade, RV blinds and Motorhome windshield shades and blinds. Also blinds for Skylights and shades for skylights. Up to 7 times more effective at stopping heat than interior shading products like blinds or residential window tinting (According to the U.S. Dept of Energy). 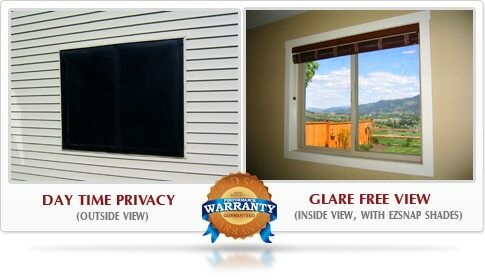 Provides daytime privacy while still allowing natural light and visibility on the inside. Can lower interior temperature as much as 15 degrees Fahrenheit. Cools the surface of the glass as well as lowers interior temperatures. Designed to be long lasting and durable in extremely hot climates and can even be left up through the winter. Reduces glare while still allowing lots of ambient light to enter. Pays for itself by lowering or eliminating air conditioning expenses. Prevents birds flying into windows. Protects windows from flying golf balls. Prevents heat reflecting off of windows and warping. or melting vinyl siding. Easily cleaned with a garden hose on or off the window. Dirt on the glass does not show up when shade mesh is installed, as compared to glass without mesh. WINDOWS LOOK CLEANER! Optical Grade Mesh, designed to block the Heat, not the View. Unlike window tinting, there is no risk of damaging your window’s weather seal. It is easily removed for storage, cleaning or to benefit from the sun’s heat in the winter months. Unlike tinting that can be scratched our mesh is child and pet resistant. Can be used on nearly any size or shape of window. It is easily installed by first time “Do-It-Yourselfers” without specialized tools. Helps reduce global warming by reducing power heavy air-conditioner use. Adjustable EZ Snap® Fasteners allow for a professional, wrinkle free install every time.